I’ve talked a lot about my recent trip to Florida (and hopefully I haven’t bored too many people with it). While we spent a lot of time in theme parks, we also took the time to enjoy other local attractions. My friend, Rowena, has a knack for finding the most interesting stops in any location, and Orlando is no exception. Since our vacation began with a fourteen hour drive down the east coast, we decided to relax at a familiar haunt upon arrival with dinner at the Rainforest Cafe. Having lived in Toronto for eight years, I’ve been to the Rainforest Cafe several times. It was interesting to see the similarities and differences of the restaurant in a new city. 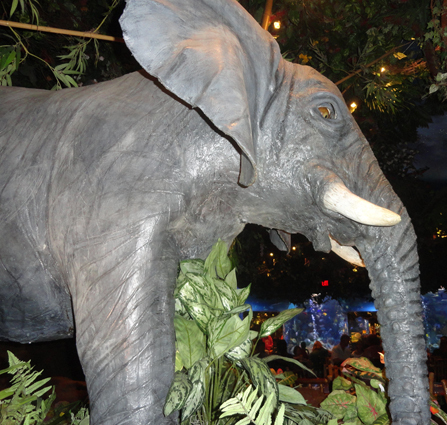 For one, the Rainforest Cafe in Orlando is probably twice the size of the one in Toronto. Toronto has one starry sky area (under which I’ve had more than one anniversary dinner), Orlando has at least two. Also, the animals are more spread out in Orlando, so there are more opportunities to sit near them and take photos with them (which makes sense for a larger restaurant). The storms were pleasantly familiar and refreshingly new, since each restaurant is laid out differently. We sat next to one of the elephants and I ordered my favorite dish. Interestingly enough, it seems some of the food preparation is different depending on the location. I’m not sure if it’s just a difference between US and Canadian cuisine, but it was interesting to note small differences in taste and plating. One of the most exciting non-theme park ventures was my first Cirque du Soleil show. I’ve seen bits and pieces of their work on TV, but it loses a lot on screen. There’s nothing like seeing that kind of performance in person, and Rowena knew the best seats in the house. 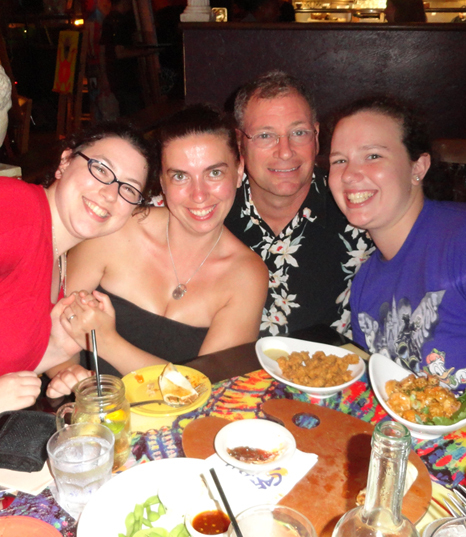 We saw La Nouba, which is located in Downtown Disney. I wish I could do justice to the experience, but I think all worlds fall flat. I’d always been under the impression Cirque du Soleil was some artsy-fartsy expressive performance piece I just wasn’t capable of comprehending. I couldn’t have been more wrong. It’s about as far from your typical three-ring circus as you can get. Instead of parading each act in front of the audience with announcements and fanfare, where mistakes and delays are easily noted, Cirque du Soleil blends everything into a mostly seamless performance piece, where set and act changes become part of the show. There’s SO much happening on stage during Cirque do Soleil it’s sometimes hard to know where to look. And I felt I missed so much. Near the end of the show, during the flying trapeze act, one of the very last catches failed. It was one of those complex leaps where they spun and flipped and you could see the two performers make contact, could see their fingers close and slip and into the net one of them went. In a normal circus I think there would be disappointment from the crowd and perhaps that would have been the end of the act. But in Cirque du Soleil they just make it part of the show. There were other performers on stage, of course, and three of them (my favorite characters) went to stand beneath the ‘dropper.’ They nattered at him in gibberish as if scolding him for his failure and while we were distracted by this, the trapeze artists reset. Their second attempt was a dramatic success. I’m given to understand there were other mistakes during some of the other acts. Rowena, who’d seen the show before, pointed out some of the implements were dropped during one of the acts that shouldn’t have been. But if she hadn’t told me, I’d never have known. With everything else going on, it all seems so natural, as if everyone ends up where they’re supposed to be and when even if they don’t. Needless to say, I was riveted for the entire performance. I hope to return to La Nuba some day (hopefully with my husband) and I’d be thrilled to see any one of their other shows. I’m definitely a convert. One of my favorite spots during the entire trip was Cafe Tu Tu Tango, another place I don’t think my descriptions can do justice. Let me just say, everything about this place is amazing. It’s a tapas restaurant. Basically you order appetizers, they come to the table, you share, you order more. You’d be surprised how quickly you can fill up on tiny portions. I thought for sure we’d order twice as much. Everything was delicious. We even tried alligator. I had alligator you guys (and I’ll be honest, it tasted like chicken). But dinner is only half the experience at Cafe Tu Tu Tango. The atmosphere is filled with art. There’s art everywhere. There are sometimes artists making new art. There’s even chalkboard paint in the bathroom hallway for you to add and leave your own art. And all the art is for sale (which was heartbreaking because I saw SO many pieces I wanted to bring home and couldn’t afford a one). A live band played music for awhile after we sat down and we danced in our chairs. But I think the ultimate highlight of the evening was the magician. He came to our table shortly before the band started to play. Now I know a lot about slight of hand magic. I’ve seen magicians and I’ve been amazed by them, but I’ve only ever seen them from a distance. And having done a lot of reading (and watched a lot of the masked magician), I know enough about how magic works to be skeptical every time I see a recording. But this was different. I mean this guy handed me an orange squishy ball and when he told me to open my hand two minutes later, there were two balls there. I know he only handed me one. I know he didn’t touch my hand at any point after that. And yet there in my own hand were two balls, side by side. I can’t even that’s how amazing it was. I can guess a few ways he might have accomplished this trick, and even so it blows my mind. Actually experiencing slight of hand turns out to be way more amazing than viewing it from afar, even if you know it’s just an illusion. At the end of the night, the restaurant even gave us key-chains to commemorate our experience, and it was an experience, let me tell you! If you’re ever in Orlando for any reason, try to take a trip to Cafe Tu Tu Tango because you won’t regret it. 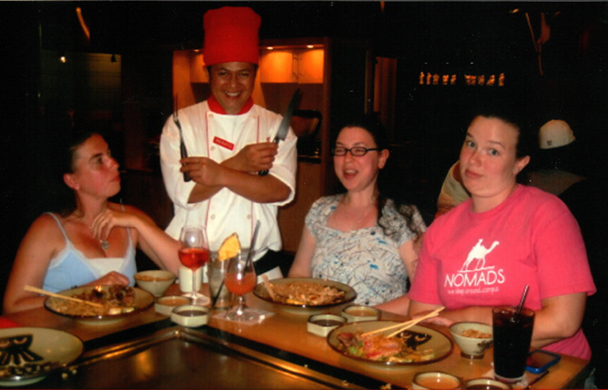 The night we left Universal early, we took a trip to Benihana, which is a hibachi restaurant. It was only my second time at a place like that and it was phenomenal. For those that don’t know, hibachi is entertainment as well as just dinner. You get to connect with people you’ve never met before as all of you sit around the big grill watching the chef do tricks as he cooks your dinner. The staff were both funny and friendly. They offer you pictures with your chef at the end of the performance and our waiter even snapped a silly picture for us (while I was still chewing) as well as the regular posed picture. A fantastic night (which rounded out a frustrating day). When our last night at Epcot rained out, we took a trip to the Planet Hollywood, also located in Downtown Disney. We stood beneath the awning in the pouring rain to put our names in, then dashed up the stairs to get our table. It was only my second trip to a Planet Hollywood and it was far more enjoyable than the first (which had been part of a school trip and thus proved more stressful than impressive). We sat on the second floor which was a massive half circle. On the far wall was a two story circular screen that played old video clips (and occasionally camera footage of people dancing on other floors) while music played in the background. It was an overall great experience and it let us end our vacation on a high note despite the heavy rain and change of plans.